Dosa a very common breakfast item made in many of the houses.Here i'll show how to make different variations that make the taste unique. 1.Soak all the above Ingridents in water for 5-6 hours. 2.Drain the water after 5-6 hrs and blend into a smooth batter,add salt and put it in a warm place for over night so that the batter ferments and gives a good taste to the dosa. 3.In the morning take the batter and put in fridge..over fermentation causes the batter to spoil. 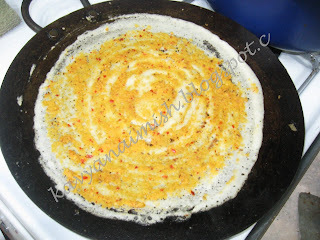 4.Put a tawa add little oil and now make round dosas and oil on the surface of dosa . 5.When it turns light gloden color turn it to the other side and after a minute turn n then serve. 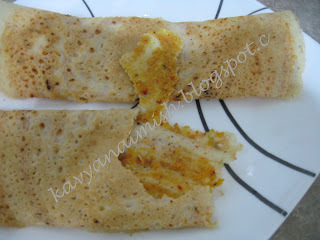 Using the same dosa batter we can make Onion Dosa,Karam dosa,Masala Dosa with normal potato masala,Green Peas Masala Dosa, Panner Butter Masala Dosa..
1.In above step 4 add the chopped onions after making dosa add chopped onions and sprinkle little karampodi all over the dosa. 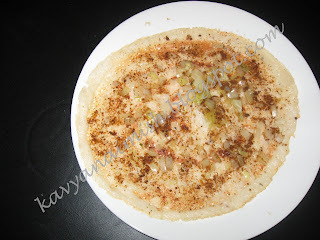 Karam Dosa(Ulli Karam),I had this is in Vijayawada when I was doing my Intermediate. 1.In a pan add oil and when heated add jeera and when it splatters add channa dal and fry till turns golden brown now add red chillies and cocnut powder fry for a minute and allow this mixture to cool down. 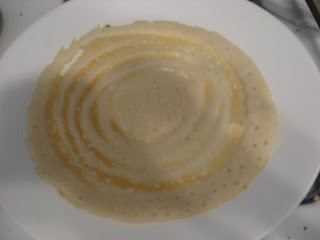 2.Blend the cooled mixture into smooth paste and put aside. 1.In the procedure of making dosa,after step 4,take half spn of blend vulli karam mixture on the dosa and the add oil and let it cook. 2.Now serve the dosa with the desired chutney. 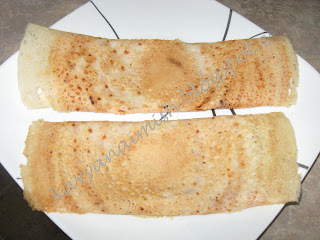 Dosa is my fav!!.. looks soo tempting!!... you have a wonderful collection of recipes! !